‘It’, the latest in a long line of Stephen King novels to be adapted for the cinema is thankfully a better adaptation than the mess that was ‘The Dark Tower’ earlier in the summer. Of course, ‘It’ has a popular TV mini series and an iconic performance from Tim Curry to live up too, but for the most part I thought it did an excellent job and this was a really good movie. Taking place in the small town of Derry, Maine, the film focuses on a group of seven children who are terrorised by an evil being that mostly manifests itself as a clown. The time period is updated to the 80s from the novel and it’s a wise choice that allows the pop culture of the time to feed through into the character’s experiences. ‘It’ has an incredibly strong opening that perfectly establishes the tone of the film whilst allowing us a first glimpse into the character and mindset of Pennywise the Dancing Clown. Any doubts about Bill Skarsgard’s casting in the iconic role subside almost immediately in a suitably menacing encounter with poor Georgie Denborough and whilst Skarsgard remains good, the film never betters this moment, albeit there is much still to enjoy as the story starts to unfold. I think part of this is down to the frequency in which Pennywise appears, thus dulling the impact and removing the fear of the unknown that characterises the greatest horror films. Like many films, the sense of dread dissipates with each appearance and it often veers into comical as opposed to scary. That being said, the story is strong enough around it and ‘It’ has a lot more going for it than your mere jump scare horror fodder. The summer adventures of the main characters feel like a perfect echo for another King adaptation in ‘Stand by Me’ and each of the child actors, led by the relatively seasoned Jaeden Lieberher, deliver charming and affecting performances. 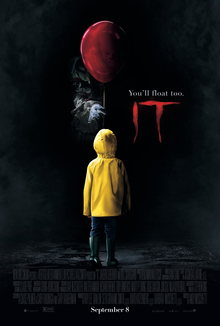 The film has the horror of Pennywise at its heart, but it doesn’t shy away from exploring the coming of age aspects of the story, with each of the main characters coming to terms with the challenges of adolescence, and this dovetails neatly with the horror raining down on the small town. I found myself fully invested in the characters and the mythology behind Pennywise, and it’s always a good sign when you come out the cinema wanting to know more (which we hopefully will in the second chapter). ‘It’ is a really good Stephen King adaptation that does justice to one of his most frightening creations, and whilst it’s undoubtedly let down by an over-reliance on jump scares, it more than makes up for it in solid storytelling and the winning performances from the young cast.